I've always liked to carry a fire extinguisher in my vehicles. Vetteworks makes a nice bracket (model C605) that attaches to the passenger seat rails. It weighs 2.5 lbs and accepts an Amerex 385TS fire extinguisher which uses Halotron 1, an environmentally friendly clean agent that does not leave residue like Halon. Chevrolet used Vetteworks fire extinguisher brackets in the 2006 C6 Z06 Brickyard 400 and Indy 500 Corvette pace cars. 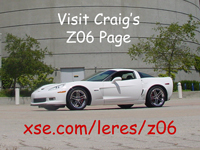 I never realized how rattle free my Z06 was until I installed the fire extinguisher. The pin and lever both made a lot of noise until I quieted them with a piece of foam and a velcro cable wrap.